Situated only steps away from the sand, nearby local restaurants and nightlife, this coastal duplex proves the adage that location is everything. 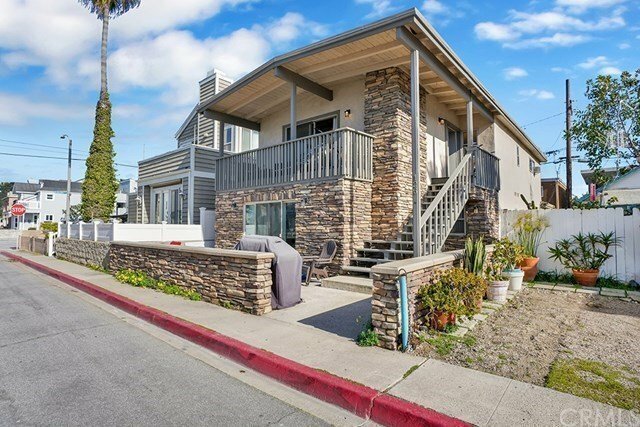 A turnkey investment opportunity with an upper unit that displays peek-a-boo ocean views from the upper deck, the property features a low-maintenance stacked stone exterior, two fireplaces and a two car garage. Vaulted ceilings and ocean breezes create an airy, open feel in the upper unit, which includes a remodeled kitchen with granite, three bedrooms and two updated bathrooms. The slightly larger lower unit has also been remodeled, with granite in the kitchen and new bathrooms, plus thoughtful finishing touches such as crown molding, stone floors and recessed lighting. The property offers easy access to local beaches, shopping and dining, this has the potential to provide the owner with a lifestyle many can only dream about. Live in one unit and rent the other, to capitalize on owner-occupant-friendly down payments, or simply ponder the fact that this unique coastal residence could allow you to build equity while you relax and sip coffee, go surfing or dine at a great local eatery—the options are endless.